Thanks very much for coming by. As you might guess, we publish poems consisting of a single sentence. Here are the rules. Subscribe to this site by entering your email address in the thing on the right side of this page. Then click the big orange SUBMIT button. We will not give away or sell your email address. It will toss a poem in your inbox on Tuesdays through Saturday. Or, whip over to Facebook, if you’re into that kind of thing, and join this group. Here’s what we look for in one-sentence poems. 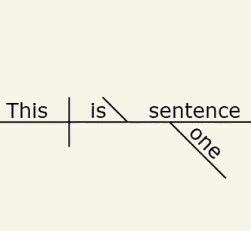 It must be an actual sentence. We all remember what Mrs. Tate taught us about sentences in elementary school. DO NOT FREAKING DISAPPOINT MRS. TATE! End with a terminal punctuation mark. But don’t die. Semicolons are discouraged, especially when used to merge what should be multiple sentences into one long sentence. Also, it’s a really ugly punctuation mark. We prefer left-justified. Weird layouts give us migraines. Please submit a third person bio. Your bio, in keeping with the spirit of the journal, should consist of a single, relatively short sentence. We publish a poem on this website one to four weeks after it is accepted, depending on some things such as our backlog and, since Dale posts them, whether his medications are properly titrated. Our schedule is typically Tuesdays through Saturday. On Sundays and Mondays we just sit around. Our staff of interns bring us doughnuts. We send out a tweet (on our Twitter account) when we publish a poem. We also will post a link to new poems on the facebook page we share with Right Hand Pointing. We use the Submittable account associated with our sister site (mother site?) Right Hand Pointing. Choose the One Sentence Poems category. Here’s the link. Thanks. If you need anything, pop us an email at editor@onesentencepoems.com.